Why choose ThorFire rechargeable bike headlight? ✔2 x 18650 BUILT-IN BATTERIES✔ In order to provide riders with the maximum run-time, ThorFire bicycle headlight utilizes the most efficient and highest-capacity lithium 2 x 18650 Battery Pack. It provides you at least 4 hours and 15 minutes run-time (TRUE RATED) on the highest 2000 lumen setting. ✔HIGH PERFORMANCE 2000 LUMEN✔ With two LEDs, the USB rechargeable bike light delivers breakthrough 2000 lumen output (Maximum Beam Distance: 300 meters) and efficacy on the highest setting. ✔ USB RECHARGEABLE✔ ThorFire bike front light can be charged directly with any USB port, mobile phone USB charger, Laptop USB port, power bank USB port and other USB devices. ✔ MULTIFUNCTION✔ ThorFire cycling headlight can be used as an emergency flashlight, keep it inside your car, basement, attic, and emergency kit. Use it when you're running, jogging, hiking, camping, walking your dog, cycling, changing a tire, night time family/kids activities, power outage and MORE! ✔ WARRANTY✔ ThorFire provides 40 days full money back guarantee and 18 months hassle-free warranty with considerate customer service. Notice: Please make sure the bracket is installed tightly with both the bike light and the handlebar before riding. ❤【SUPER BRIGHT TO KEEP YOU SAFER】: ThorFire bike light is powered by the latest T6 LED technology, provides an ultra bright with 2000 lumens output and up to 300 meters of vision. This bicycle headlight makes your night riding safer and confident. ★Notice: When you press the button for a few seconds, it will become strobe. ❤【USB RECHARGEABLE & LONG LASTING BATTERY】: ThorFire bicycle light comes with rechargeable and durable 2*2200mah battery which has smart charging technology and has run time of Up to 4 + hours on high after fully charge at your computer or a wall charger (USB charging cable included). 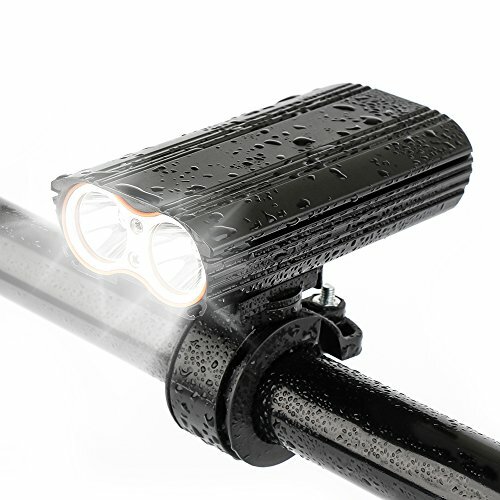 ❤【VERSATILE & WATER RESISTANT】: ThorFire cycle headlight can be used as an emergency flashlight. You can keep the light whenever and wherever, and use it when you're running, jogging, hiking, camping, cycling, night outdoor activities, etc. With water resistant plastic, you can enjoy clear visibility during rain, dark nights and on any occasion. ❤【EASY TO INSTALL & PORTABLE】: ThorFire cycling light comes with a central bracket and a 360° bracket, you can easily fixed it to the bicycle handlebar without tool. Also this bike headlight weights only 234 gram, it can be a portable torch. ❤【100% MONEY BACK & SATISFACTION GUARANTEE】: ThorFire provides 40 days full money back guarantee, 18 months hassle-free warranty with considerate customer service.